What a tasty, healthy way to use up that left over pumpkin. These burgers are fun to make, very easy and super tasty yum. Peel the pumpkin (using a strong vegetable peeler) then chop into slices, 1 inch thick. Lightly coat with vegetable oil and a sprinkling of salt and place in the oven. Cook for 40 minutes to 1 hour or until very soft and golden, turning once. To roast the cashews, pop them on a baking tray (without oil) and place into the oven for 5-10 minutes, turning once. Cook until golden and releasing aroma. Grind them using the pulse function on a food processor or chop finely if you don't have one. While the pumpkin is cooking, lightly fry the onion until soft. Add the chilli and the ginger and cook for another 2 minutes. Add the ground coriander, cumin, turmeric and chilli powder and cook for a minute or two then turn off the heat and set aside. In a large mixing bowl mash the chickpeas using a potato masher, but leave some texture. When cooked, add the pumpkin and mash it into the mixture until fully combined. Add the ground cashews, salt and onion mix. Stir until combined. Add 6 tablespoons of flour and check the consistency. It's alright if it's a little bit sticky (as it will dry out in the oven) but you need to be able to shape them into patties so add more if necessary. Shape 8 large burgers onto a lined baking tray and pop into the oven for 10-15 minutes. Take out and then lightly fry on each side. 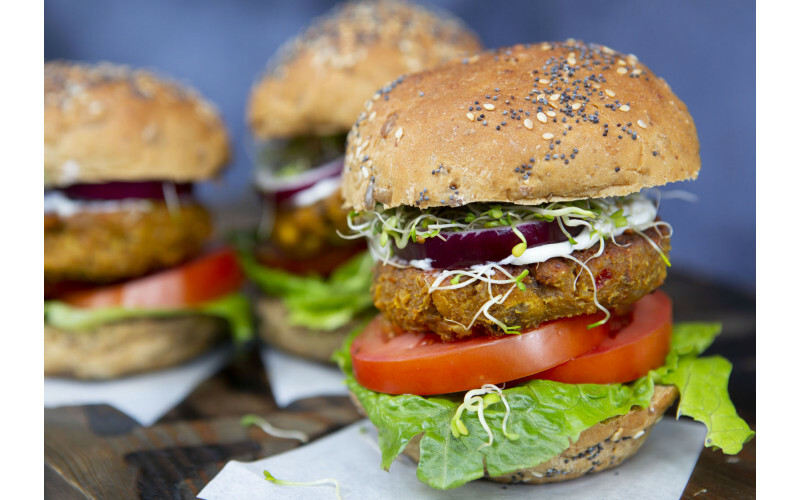 Serve in a bun with salad, vegan cheese and mayo.